The church in Turkey needs help. Langham Literature is trying to respond by supporting a small but strategic publishing ministry called Haberci (The Messenger). Thanks to supporters in Australia, we can now rejoice in their publication of the Bible Speaks Today commentary on Ephesians by John Stott. ‘I cannot describe the thrill every time a Bible Speaks Today commentary is published in Turkey. It is generally the very first of its kind. 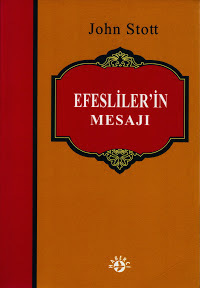 Most books of the Bible still do not have a single commentary in Turkish. Believers in the West are rich in Biblical helps and resources, and if they wish to deepen their understanding there is a vast array of resources at their disposal. However, in Turkey the picture could not be more different. Unless a Turkish believer knows German or English, there is very little to draw from. The Turkish evangelical church all but disappeared for many generations, and is only in its first generation again. Consequently there are very few Biblical resources to help church leaders and believers grow and deepen their faith. We believe it is vital to get good Biblical literature into the hands of the Turkish church as soon as possible. The printed page has never lost its power, and it remains a vital source of equipping and teaching the church in Turkey.